Ooh, depends which day you ask me. Today I’m going to say – overcoming my fear of public speaking. I was recently looking at the speech I gave for the school Burns Supper when I was 16 and remembering how terrified I was and how I rehearsed it incessantly till it was pretty much memorised. If you’d asked me then, I’d never have imagined speaking casually to hundreds of people with no notes, or presenting to high-up executives. 2. Who was your favourite teacher at school and why? This is a really tough question because there were so many! My favourites on a personal level were probably the whole music department (particularly Mrs Harris and Mrs Tasker), who allowed me free run of the department and use of empty practise rooms, treated me like an adult and generally provided a refuge from the outside world. On the more academic side, Mr Montgomery the maths teacher, who gave me maths and logic puzzles when I’d finished my boring work, and encouraged me to enter maths competitions. He always admitted that he hadn’t been a great mathematician himself, but he really knew how to stretch a keen student. Finally, Mr Maiolani was a brilliant English teacher and his massive set of questions on Romeo and Juliet was the homework that I actually looked forward to during my Highers year. 3. Which household chore do you most dislike? 5. Do you have any guilty pleasures? Crap TV programmes about houses, particularly Location, Location, Location. Diet Coke (particularly stupid since I’m mega-sensitive to caffeine and I religiously avoid aspartame in all other contexts). Cake seems like it ought to be a guilty pleasure, but has absolutely no guilt associated! 6. What’s the first website you look at when you turn your computer on? 7. If you were going to audition for Britain’s Got Talent, what would you do? Oh Lord, do I have to? I’m hoping that after I attend the performance poetry class I’m going to next month, that might be an option… but in reality I’d just run away fast. 9. Fancy dress parties: love them or hate them? Hate the preparation, kind of OK when I’m there. Would still rather have a regular party. 10. What is the best holiday you’ve ever had? 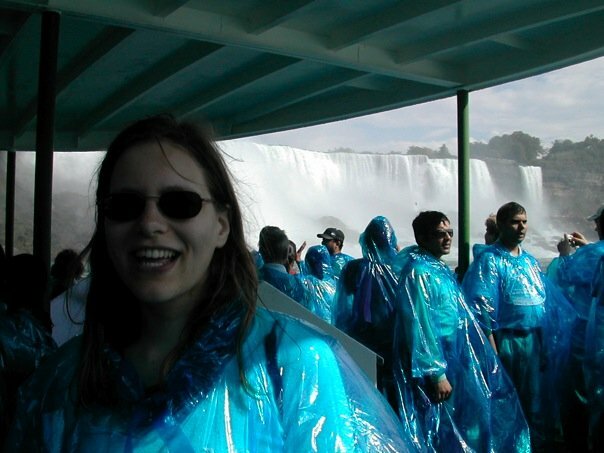 I’m going to say the holiday we had in New York City and upstate New York with my friend A. It’s the only time I’ve done a full-on mad tourist 10-places-a-day sort of city break but we followed that up with some days chilling out in a small town upstate where A lives, and driving up to Niagara falls. A fantastic combination. 11. If you had me round for dinner, what would you cook? You’re welcome any time, you know! I’m much more inclined to what Nigella calls a ‘kitchen supper’ than a dinner party. I’m going to say lamb and spinach curry, and inveigle Mr Woodsmoke into making his fabulous naan bread. Mango sorbet with trivially easy raspberry sauce for pud.